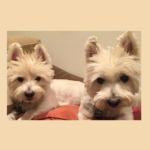 Prince and Snowball, better known as the “Little Westies,” passed within 1.5 months of each other (July 10, 2015 and August 24, 2015). I wanted to post their incredible story today and thank the entire staff for being so wonderful to them especially Dr. Amanda Williams. Although my heart is broken into a million pieces, I am focusing on the best awesome memories a fur mom can. Everyone loved my boys and always thought they were twins although they were two years apart and from two different states. They gave me the most unconditional love and I spoiled them with everything I could. I know they both are totally at peace…no more suffering, and that comforts everyone. I used to worry about Prince passing first and whether Snowball would be able to endure the loss. That worry was taken care of..they both were ill at the same time, and my precious Snowball went first. I thought I would have Prince at least until the end of the year but his illness consumed his body almost overnight. My precious boy hung on for me….when I took him to Center-Sinai to end his suffering…he said, “No mom…. I got this,” and passed on his own. I will forever love them and will forever be grateful to the excellent services provided by Center-Sinai. Everyone be well, and love your fur kids like there’s no tomorrow! !